“Maskihkiwiwat” is what I decided to name my piece; Maskihkiwiwat is the translation to medicine bag in Cree. The designs and images on the bag are not the traditional and natural medicine used among the Indigenous people. I created this bag to make a statement about modern medicines that are now used and replaced most traditional medicines. Traditional teachings were lost and replaced with mainstream teachings due to residential schools and the hundreds of years of colonialism. Many Indigenous people do not know their traditional teachings and medicine picking is a common one. Although that is not to say that all the teachings have been forgotten or replaced. Addictions are one epidemic that spreads across the nation in Canada and it is no secret. Today it is common to see many modern medicine and tools being used and abused. Modern medicine can be used to bring life but they can also bring death into our communities. 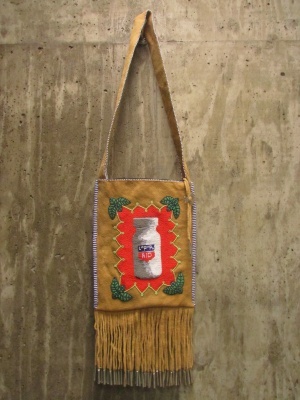 This medicine bag can be seen as a sign of life and hope or it can be a sign of pain and suffering. This is the truth behind this statement. Although many Indigenous people suffer with addictions as well but there is still the passing of hope through traditional teachings. Natural medicine picking and using is still being used today and continues to be passed on. I carry sacred and natural medicine in this medicine bag to carry on the message of healing, traditional teachings, hope and life for our future generations.